The twentysomethings in the back room playing board games are missing out. The real action is at the bar, where silver-haired ladies flirt with ex-frat boys and the occasional indie-rock couple. It’s tough to find a place in Wrigleyville where worlds collide and all are welcome for a mildly drunken kumbaya vibe, but that’s exactly what this is. El stop: Red to Addison, Brown to Southport.. Bus: 152. I went to Guthrie's for the first time the other weekend before heading to the Music Box and I loved it! If you're at all a nerd like I am, the best feature is definitely the unlimited supply of board games. I can't wait to go back for a scrabble date night with my fiance. You have to appreciate oddities to really enjoy Guthrie's. The ceiling is painted and has a lot of unique 3-D art components. 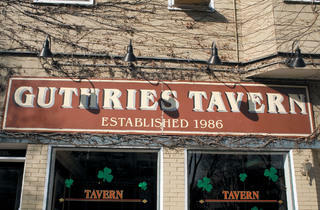 If you're looking for a typical Wrigleyville club, this is not your space. If you're wanting a cool bar where you can put back some drinks and have a conversation, Guthrie's is the best. Everything about this place is cozy and cool. The decor, the games, the intimate tables, the music, and the great beer selection make this bar my all time favorite. It does not feel like any other bar near wrigley. I've moved away from the neighborhood, but come back frequently for this place. 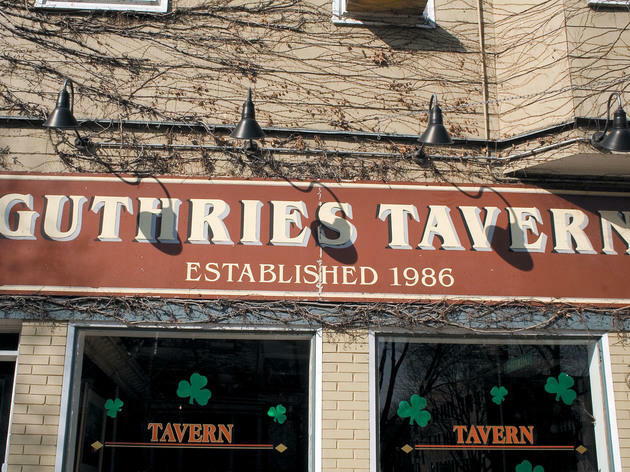 Gutherie's Tavern is a great Wriglyville spot without the down sides of wrigleyville. The atmosphere is funky and fun with a good mix of throwback music and current indie hits. It's a great place to go on a first date or with a group of people you don't know very well since they have board games for you to play.